Finally yesterday afternoon we got a much needed break from the 100 degree weather. I was watering my plants 2x a day, which is a lot considering I have partial sun/partial shade plants because I have northern exposure from my porch. Tonight I took a break from cooking and took mom out to dinner. I have found Outback to be a “safe” place for me to eat, with several things on the menu that fit my plan. I could probably find something to eat everywhere, but I’m not that brave yet. 31.7 pounds lost as of this morning, Day 39. I am still amazed at this diet, and amazed at how good I feel on it, and how easy it has been. Tonight mom and I went for a walk around the neighborhood for an hour…..well, me walking. Mom uses her scooter because she is on oxygen. And of course, I was pushing the my cat Al in the stroller. I love to walk by other walkers who smile as they walk by, and then REALLY smile when they realize it’s a cat in a stroller. I just love that. so proud of you amy! keep it up! Keep up the good work, Amy. I live in the South Chicago suburbs too, and it has been beastly hot until the last few days. I too find this to be the easiest diet plan and lifestyle change I have ever been on. I have lost consistently and am down 16 lbs. at the end of week four. Sometimes it is still a challenge, especially on my deck when I crave a glass of wine, but I know it will be so worth it when I weigh what I want ! Mary – I’m so glad you are doing the diet as well! I hope you are still doing great on it! I love that picture! 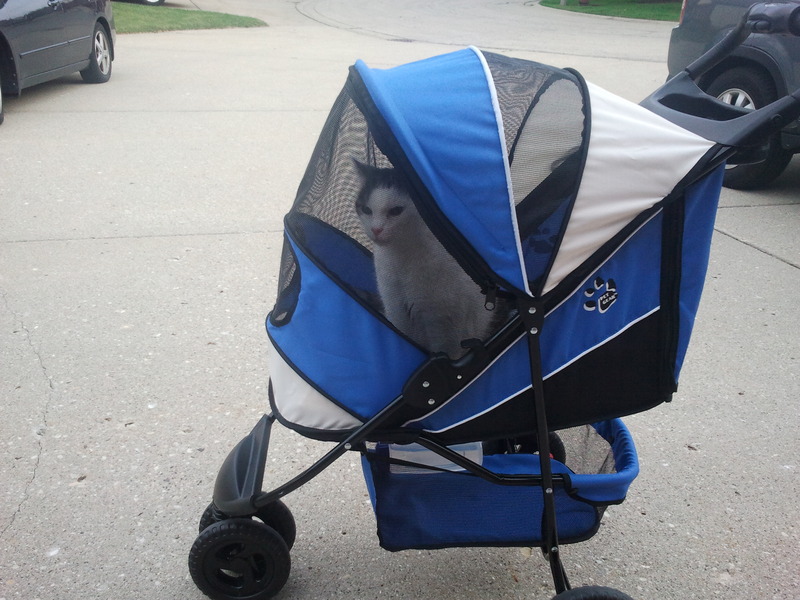 How does your cat handle the stroller?? It looks like he likes it! Oh, and congrats on your weight loss- that’s awesome! I have 2 cats that absolutely adore the stroller! The cat in the picture will sleep in it (I keep it in the house during the summer for a quick get-away), and will hop right in it when it’s time to go for the stroll. Congrats on your journey as well! oh wow! cat in the stroller. now if that’s not cool I don’t know what is. Really neat blog!